Wayne LaPierre's assignment of "A" grades to politicians who support a "pathway to citizenship" for overwhelmingly anti-gun "immigrants" means we could ultimately be waving goodbye to legislative and judicial protections for the right to keep and bear arms. 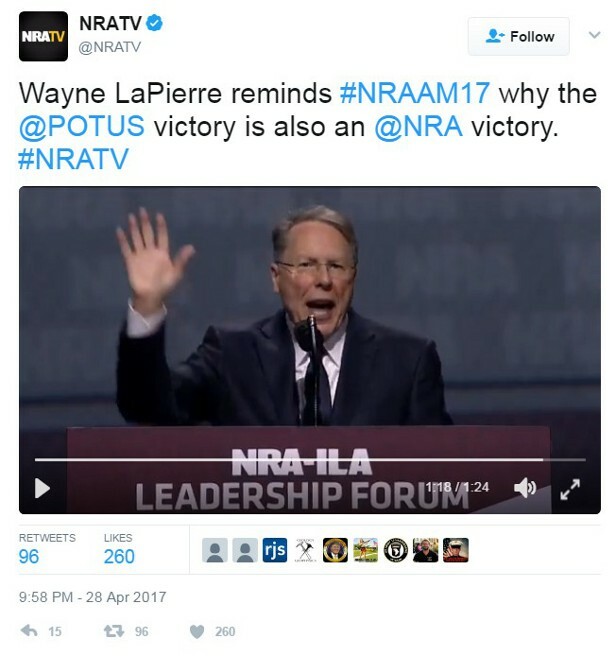 "It's up to us to speak up against the three most dangerous voices in America: academic elites, political elites, and media elites," National Rifle Association Executive Vice President Wayne LaPierre told attendees at the NRA Annual Meeting Friday. "These are America's greatest domestic threats." That they represent real threats cannot be denied. The subversive poisoning of young minds, the corruption and usurpation of power, and the lies of commission - and just as significantly, of omission - are three legs propping up a globalist agenda being advanced by evil opportunists and carried out by useful idiots, parasites and thugs. But the means yet exist for other signals to get through, and with growing public distrust and contempt for "elites" of all stripes, is it really the "greatest domestic threat" so much as the most convenient target? There's another threat LaPierre never talks about, for reasons we can only speculate: Immigration, both "legal" and illegal, and what a "pathway to citizenship" combined with so-called "birthright citizenship" will mean to continued government recognition of the right to keep and bear arms. In addition to explaining away the California experience, produce credible data - something that can be independently validated - that "amnesty" and a "pathway to citizenship" for MILLIONS of foreign nationals in this country illegally (and even legally, with current culturally suicidal policies) WILL NOT overwhelmingly favor "progressives" and anti-gunners. Show us your sources and methodologies for determining this WILL NOT result in supermajorities in state and federal legislatures that will be able to pass all kinds of anti-gun edicts. Show us how this WILL NOT result in nominations and confirmations of judges to the Supreme and federal courts who will uphold those edicts, and reverse gains made to date. Notice I didn't ask for platitudes or for anecdotes about exceptions to the rule, or about who is turning up in increasing numbers at gun stores and ranges - that doesn't matter if he can't point to a corresponding overriding shift in voting trends. I didn't ask for wishful speculation about how education and outreach programs MIGHT help bring more over to the NRA side. I asked LaPierre (and his apologists) to show how all credible estimates putting the disparity at over 70% Democrat and anti-gun are wrong (and how the needle barely moves in the right direction after 20 years). The thing is, even that's not the "the greatest domestic threat."